You are here:Home » Cotswolds Trivia - What's in a Name? 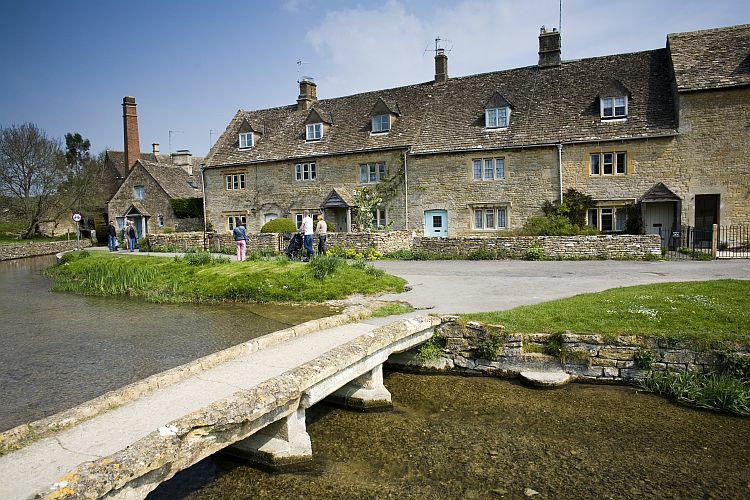 Home » Cotswolds Trivia - What's in a Name? The origin of the name "Cotswolds" is much debated, although one popular theory is that it derives from "Sheep shelters" (cots) "in rolling hills" (wolds). During the heyday of the medieval wool trade, it's estimated that some 500,000 Cotswold Lion sheep grazed on the hillsides. The names of many Cotswold towns and villages derive from Old English names going back many centuries. The word "Chipping" (as in Chipping Campden, Chipping Norton and Chipping Sodbury) relates to the Old English word meaning market. Chipping Norton means "market town north" and this town in the Oxfordshire Cotswolds is affectionately referred to by locals as "Chippy". "Campden" means field or enclosure in the valley. Chipping Campden is often referred to as just Campden, but don't make the mistake of calling it Chippy as well! The Chipping area of Tetbury was in medieval times a market and gathering space for 'mop fairs', when locals would hope to find employment as domestic staff or agricultural labourers. "Combe" (as in part of the name of places in the Cotswolds such as Sheepscombe, Winchcombe and Briscombe) means valley. "Gyte” (as in the neighbouring villages of Guiting Power and Temple Guiting) means an outpouring of water. The "Temple" portion of Temple Guiting dates back to the 12th Century when the manor was owned by the Knights Templar. The village was once a key meeting place for knights as they travelled from west to east to join fellow knights to travel to the Holy Land to fight in the Crusades. It is still home to a Templar church. 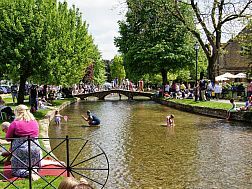 "Slaughter" (as in the neighbouring villages of Lower Slaughter and Upper Slaughter, near Bourton-on-the-Water) sounds bloodthirsty but it is probably derived from the Old English word "slohtre" meaning slough or boggy place. The Cotswold town of Tetbury, which has a recorded history of more than 1,300 years, gets its name from the Abbess Tetta who had her monastery on the edge of town in 681AD. 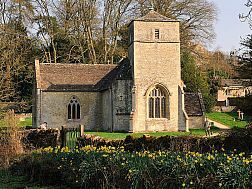 The Cotswold village of Duntisbourne Abbots gets its name from the fact that it was once owned by the abbots of Gloucester. The neighbouring hamlet of Duntisbourne Leer takes its name from Lire abbey in Normandy, which once owned it. The name Wyck Rissington originates from the Saxon 'wic' for a small farm, and 'hrisen dun', meaning a hill overgrown with thickets of wood. While Royalists were encamped іn Painswick during the English Civil War, tradition has іt thаt King Charles went up tо the Beacon and, seeing the beautiful valley tо the east said "This must be Paradise". Since then thаt valley, аnd the hamlet оn іts western side tо the north оf Painswick hаve been called Paradise.